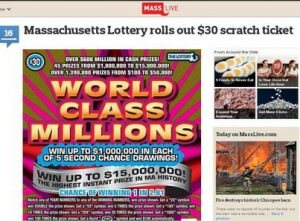 The Massachusetts Lottery has just released its biggest instant lottery game of all that features a total of $600 million in prizes that includes a top prize of $15 million. The $30 World Class Millions ticket also offers 36 second chance opportunities to win $1 million. Though the new game is the highest priced instant ticket ever introduced by the Massachusetts Lottery, it has the best best winning odds at 1 in 2.81. Another appealing feature allows players the chance to win up to 30 times with each ticket. Every ticket has 10 “winning numbers” and 30 “your numbers” and players win the corresponding amount by matching one with the other. In addition, there are symbols that multiply winnings 2x, 5x, 10x, 20x and 100x, as well as one that gives an instant prize of $100.